If you’re cruising from Miami, you can’t start your vacation without getting to the terminal first! Luckily, there are a number of easy way to get to the Port of Miami. The cruise terminal is located on Dodge Island, just across from downtown Miami. It is about 8 miles east of Miami International Airport and 25 miles south of Fort Lauderdale-Hollywood International Airport. The address is 1015 N. America Way, Miami, Florida 33132 if you wish to map your route. If coming from north of Miami, take I-95 South and exit 2B-US1/Bayside Blvd. Head south to Northeast 5th Street and turn left. Fifth Street will lead onto the Port of Miami bridge. Continue over the bridge and follow signage to designated terminal. If coming from the south, take I-95 North and exit at Northwest 2nd Street. Head straight to Northwest 5th Street and make a right. Fifth Street will lead onto the Port of Miami bridge. Continue over the bridge and follow signage to your terminal. If you’re flying in for your cruise, or simply don’t want to worry with the hassle and expense of parking, then there are plenty of transportation options to get to the cruise terminal. We recommend using Uber or Lyft as they are among the cheapest and most convenient options. There is public transportation to the port for just a few dollars, but it might be daunting for new visitors to figure out schedules and routes. Ride-sharing services have opened up a much cheaper and convenient way to get to the port. For a time they were not completely legal, but still heavily used. Now Miami-Dade County has given them full legalization, offering a cheaper and easier way to get to the port. An Uber/Lyft fare from the Miami airport to the Port of Miami would run approximately $16, compared to $27 for a taxi. If flying into Fort Lauderdale, the fare is around $33. For more details and rates, read our article here. We recommend using one of these services to get between the airport and the cruise port. They are cheaper and easier than a traditional taxi. If you are going from the Miami airport to the cruise terminal, taxis charge a $27 flat-rate fee. That’s based on the ride, not per person. So if you are traveling with a family of four, that’s about $7 per person (or $14 round-trip) — a good deal. As well, unlike shuttles, taxis leave whenever you’re ready. There is no waiting for other passengers. Expect to pay a bit more if you’re traveling by taxi from the Fort Lauderdale airport due to the longer ride. Taxi fare is an estimated $75 each way from the Fort Lauderdale airport to the Miami cruise port. Many of the cruise lines offer transfer service from the Miami and Fort Lauderdale airports to the cruise terminals. Carnival, for example, offers a shuttle from the Miami airport to your cruise for $34 round trip per person. The same shuttle runs $64 round-trip per person from the Fort Lauderdale airport. Cruise line transfers offer convenience, but we also find they can be expensive and restrictive. For instance, many are only available on the day you cruise and the day you depart. So if you’re flying in the day before, then a transfer from the cruise line won’t work. As well, prices are typically per person. A family of four taking the Carnival transfer from the Miami airport would pay $132! That’s why we suggest finding alternate ways to the port. If you are still interested in cruise transfers, you can call your cruise line for more information. In addition to the cruise line shuttles, there are independent shuttles that can get you to and from the port. The difference? They can be much cheaper. SuperShuttle — the big blue vans you always see around airports — offers everything from its traditional shared van service up to private sedan service. If you’re looking to save money, stick with the shared van service. Rates are about $16 per person roundtrip for the first rider and only $10 for each additional rider. These rates are pretty low, however, if you are traveling in a group of three or more, we’d suggest a taxi or Uber/Lyft as they will be comparable in cost. As well, these rates are for a shared van ride instead of a private taxi. There are also a number of other shuttle services, including many that provide service to the Fort Lauderdale airport or from nearly any city in Florida. We can’t list every shuttle service here as there are quite a few of them. All of the following, however, can give you a good start for your search. If you live in Florida and don’t want to drive to the port, the Florida Express Bus is an interesting option that can pick you up from most major cities and drop you off at the port. If you are staying at a hotel in the Miami, give them a call and see if they offer a shuttle to the port. 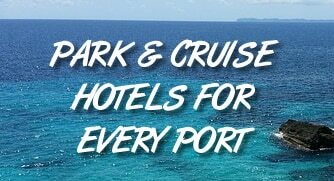 Many hotels in the area cater to cruisers and offer free transportation (and parking) as a perk. Here’s a list of hotels in Miami with cruise port shuttles. Some people simply like to go in style. In a place like Miami, that’s easy to do. There are dozens of car services in the area that will pick you up in a private car or limo. In fact, many of the same companies that provide shared shuttle service also have private car service too. Of course, this service is typically a little pricier. But if you’re splitting the cost about four or more passengers, it can be surprisingly affordable. We don’t recommend or discourage any of the following car services (we’ve never used them), but provide them as a starting point for you to see what’s available. Miami Hotels with Cruise Shuttles — Staying in Miami before your cruise? These area hotels offer shuttles to the port. I like how you mentioned many shuttle service options for transportation in Port Canaveral. My husband and I are looking to go on vacation in the area and won’t have a car, so knowing our options is helpful. Thank you for the information about finding a shuttle service from the airport or any city in Florida to get to where we’re going. if you port out of Port Canaveral, try looking at GoPortCanaveral.com. They have wonderful packages. I did not find your site helpful at all. I am not a US citizen and when I entered my phone number it was not accepted. I don’t understand how I can book a ride or be able to contact a driver on arrival at airport? Why don’t you have a contact point at Miami Airport or an office. I mean, a place I can make contact. I would like to use Lyft or Uber but it sounds too complicated to me. If you can’t use Uber/Lyft, then we have a number of other options available. For instance, you can just catch a cab from the Miami airport when your flight arrives. are there Uber or Lyft vehicles that will accommodate 5 passengers and their lugguage? Yes there are. Look for UberXL or Lyft XL. There are designed to fit up to six passengers. Although with luggage as well, we’d suggest getting two vehicles.